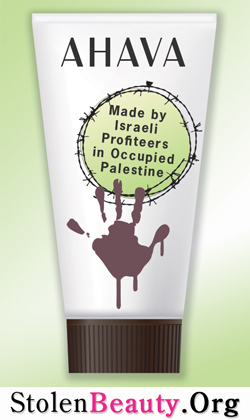 The Stolen Beauty Campaign, a project of our member group CODEPINK to boycott Israel's Ahava cosmetics, announced today that Abigail Disney, a principal investor of Shamrock Holdings Incorporated, the Roy E. Disney family fund, is disclaiming her share of Shamrock's investment in Ahava Dead Sea Laboratories. Ahava, an Israeli cosmetics firm with its factory and visitors center in an illegal West Bank settlement, is a privately held corporation. Shamrock owns about 18.5% of the company. Just last month the Stolen Beauty Campaign celebrated its three-year anniversary. According to Haaretz: "Stolen Beauty’s activity in the United States and elsewhere has helped make Ahava cosmetics one of the first mentioned in any discussion of products that are produced in settlements or in industrial zones operated in settlements but are marked 'Made in Israel.'" We congratulate CODEPINK on this victory and hope you will join us at our National Organizers' Conference September 21-23 at St. Louis University to celebrate!